It’s no secret that the 2016 Nissan Murano provides a wealth of performance specs to ensure one of the highest-quality drives around, with a massively powerful engine, a highly efficient engine, and a collection of stellar driver assist programs. 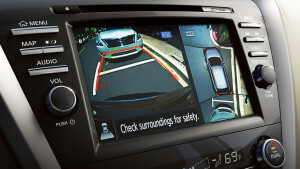 At the same time, Indiana drivers know that they can probably depend on the 2016 Nissan Murano for offering a comprehensive assemblage of safety systems. Yet, there’s one other important thing to note about this exiting new car: it’s not only powerful and safe, but it’s also a lot of fun to drive. With technologies ranging from NissanConnect and Bose Premium Audio to Steering-Wheel Mounted Controls, rear USB Ports, and Around View Monitoring, the 2016 Murano proves again that Nissan is at the top of its game when it comes to smart driving. 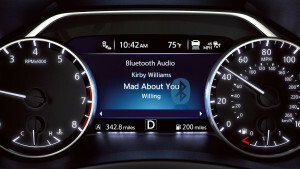 With NissanConnect, you’ll be able to stay connected at all times by plugging your smartphone directly into your vehicle and accessing a wealth of both your own app and music but also a custom-made Navigation system to help you identify your destination and generate the maps to get you there. Bose Premium Audio gives you as many as eleven speakers as well as dual subwoofers, but it also provides you with a speed-sensitive volume control that allows you to cancel out any extra noise in the cabin of this car. The Murano also makes sure that you’re as safe as possible by installing audio and other controls right into the steering wheel of the car, allowing you make track selections, adjust the volume of music, and much more without taking your hands off the wheel. Keep your own—as well as your passengers’—devices charged at all time with these USB ports, installed in the rear of the car. Finally, the Murano comes equipped with an Around View Monitor System to keep you updated on all events surrounding your vehicle and allowing you to respond as quickly as possible. Test Drive the 2016 Nissan Murano Today! When it comes to technology features, the best approach is to try them out yourself. After all, there’s only so much good we can do in trying to describe stellar systems like those include din the Murano. Luckily, you can try these all out for yourself by stopping by our Sorg Nissan dealership anytime. Find us at 2845 Detroit Street in Warsaw, fill out our online form, or give us a call at 574-267-5850 in order to arrange a test drive or just chat about what makes this car so special. Don’t delay: explore smart technology in the 2016 Nissan Murano today!